I know I got some American goodies a little while back, but I don’t feel like I’ve done a proper ‘haul’ in a while. But, recently I picked up (and was kindly sent) some things so I couldn’t not share them with you. I do love a good haul post, me. First up are some amazing goodies from World Duty Free. I sadly couldn’t go to their event in London, but got some lovely things to try out and I’m so excited. First up is this b-e-a-uuu-tiful YSL Extremely YSL Tuxedo Palette which contains a mix of lip, cheek and eye shades plus their mascara which I’ve been dying to test out for ages. The shadows are beautiful, especially the glittery black shade. Such a perfect set! Next is an Elizabeth Arden Eight Hour Cream Gift Set, which contains the classic Eight Hour Cream, the Eight Hour Cream Intensive Hand Moisturiser and an Eight Hour Cream Lip Balm. I’ve never tried this cult product, so am looking forward to giving it a test, plus the lip balm addict in me is very happy the set contains one! Finally, who doesn’t love mini perfumes? The Marc Jacobs Daisy Delight (4ml) is the perfect size to pop in your handbag, plus the scent is delicious. It’s fresh, lightly floral and stays on skin for hours which is my kinda perfume. I love the packaging, as with all Marc Jacobs fragrances, they’re just so pretty! 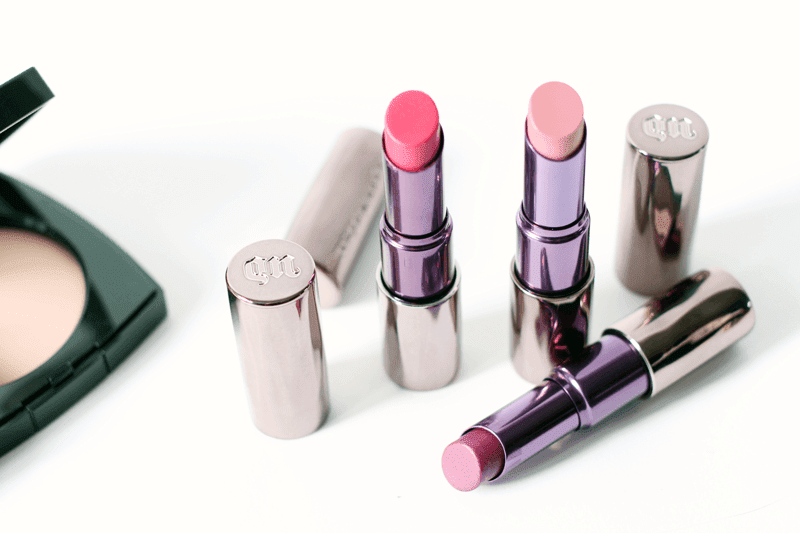 Next are three Urban Decay lipsticks I was inspired to purchase after a blogger chat. Y’all are enablers! I picked up the Urban Decay Revolution Lipsticks in Fiend (a soft pink), Catfight (a bright pink) and Venom (a plum/purple). They’re a really good formula and stay on for hours without needing to reapply. I’m so glad they’re part of my collection! Now, I rarely buy Chanel. 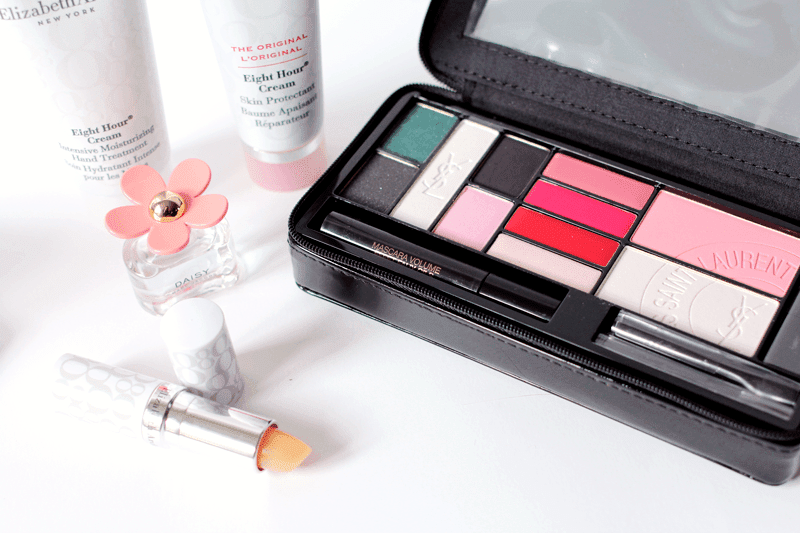 The packaging is divine, the products are beautiful but the price is just more often than not completely out of my budget (for makeup, that is, skincare on the other hand…). But, I’d be saving up some cash and, after swatching the eyeshadow palette approximately ten thousand times, I decided to bite the bullet and pick it up. 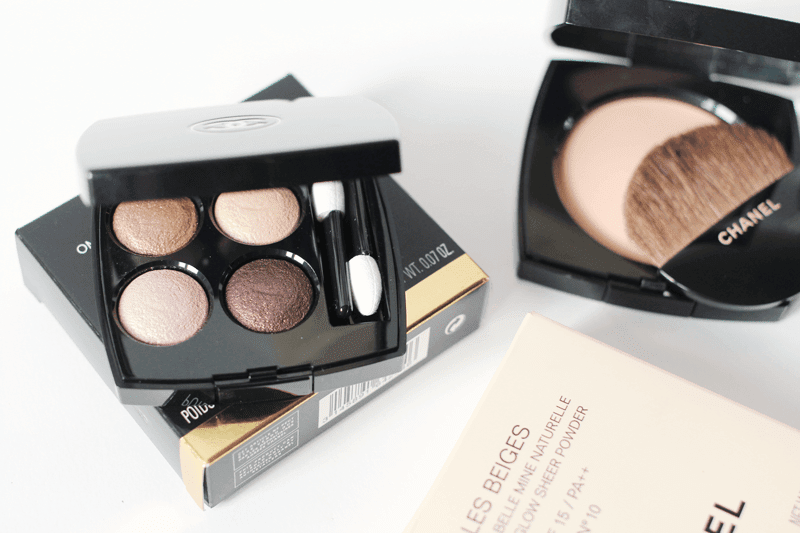 So the Chanel Eyeshadow Quad in Poesie, with its beautiful purple shades, came home with me along with Chanel Les Beiges Healthy Glow Sheer Powder. I’d read reviews in the past and always wanted to try it, so it had to be mine. I’m rather impressed so far as it doesn’t look cakey on the skin! Have you been buying anything recently? Make sure you check out my blog sale!